The first step is to decide what the space will be used for. Do you want a place to relax, entertain or both? This determines the amount of work and expense that will go into the project. Look at the surface. Will you need decking to cover the area or can you rely on the existing surface? Some people alternate between paving and decking for different parts of the yard. Identify the furniture required. Again, this depends on the above. Entertaining guests will mean more furniture, while a relaxing area for two will mean a few chairs and a patio cushion or two. Now decide on the aesthetic details like color and the sort of chair cushion covers you will need. 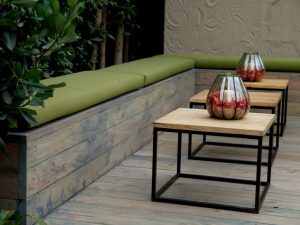 Colors can add a lot to an outdoor area and it is good to experiment with brighter, louder colors. Lastly look at how you want to protect the area. 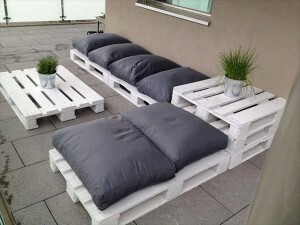 Outdoor furniture requires some protection from the sun and elements. If there is no space to move the furniture to storage during the winter months or during storms, then invest in good outdoor furniture covers. The Foam Factory is a specialized store in various foam products including foam for sofa cushions. Maintaining the look of your entry doors is an important thing to keep up with, not only for aesthetic reasons, but also for security and usage purposes. Because you’re using these doors every day, you might notice that they’ll slowly develop small cracks, which then grow larger until they begin warping your wood. Pre-hung doors are an ideal option if you’re looking to replace your doors without hiring a contractor to do it for you. They’re also basic enough for the average homeowner to put up without too much difficulty. If your frame fits two front doors, there are also pre-hung exterior double doors that can be customized to your liking. To install a pre-hung door, you’re going to need to first remove the door that’s going to be replaced. Once that has been completed, carefully remove the molding and pry away the door jamb. Now that you have a bare opening, calculate the dimensions. Measure the width between the jambs on the side followed by the head jamb to the seal as well as the thickness of the wall. It’s imperative that you measure each part carefully. Next, you’re going to need to determine whether or not additional framing is needed – for example pressure-treated lumber to complete the frame. Finally you’ll be able to fit your door into its place followed by a thick layer of caulk around openings. Secure the door with cement screws at the shims. Then, test the operation of the door to see if it is blocked by any excess materials. After safely securing the door and testing it out multiple times, wait for the caulk to dry and check for any straggling pieces of wood. The only thing left that you’ll need to take care of is cleaning the door and the frame. Your door is now ready to fully function as the newest addition to your household. Bio: ETO Doors is one of the largest door manufacturers that sell everything from modern doors to French doors. Be sure to check out their inventory today. Purchasing a new sofa or a couch can be a large investment on its own. If you have an older sofa but are having trouble with it constantly sinking in and feeling limp, you might automatically believe that you need an entirely new sofa. Well, that’s not always the case. Instead of spending hundreds, maybe thousands, of dollars, why not look to purchase new cushions instead? Many times, the problem doesn’t lie in the sofa frame itself, but in the cushion filling. You can easily pinpoint where the problem is by checking the frame and the cushions. If you take off your cushions and perform a pressure test by pressing on it and seeing how far it will rise back up, you can determine whether or not they need to be replaced. There are plenty of manufacturers that can make custom foam cushions for you. By supplying the exact measurements and specific style of comfort that you want, companies can practically create your own personalized seat cushion. Many couch owners are turning to this as they tend to last longer than standard seat cushions. High quality foam is the number one priority for you when you begin scavenging the Internet – the higher the quality, the longer it’ll last in the long run. Be sure that you compare prices to find the best available deal on the market today. If you find a product that is priced cheaper than its competitors, take the time to look into why it is. Professional graphic designer Jen Allyson had a right budget for her home renovation. After compiling a list of what should be prioritized, she then proceeded to shop for all the low-cost materials needed. She created a budget for each room that needed to be worked on and made sure not to surpass it. For the hardwood flooring and stairs, she avoided hiring a contractor and saved over 40% in the end. 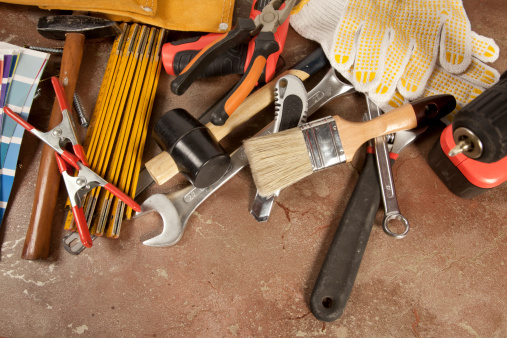 If you are like Jen and want to renovate or fix up your home without having to uncontrollably spend, then these tips will help you. Air conditioners are crucial for areas with high temperatures. Many of them come with warranty’s that can be renewed annually. Put it this way, would you rather spend the $100 per year to ensure its upkeep or deal with the hassle of it randomly breaking down on you causing you to fork over thousands for a replacement. Your fence plays a role in your house’s appeal. Small cracks or missing bricks seem like an easy and cheap repair. Sometimes that’s not the case. It could be a signal that something bigger is going on with your foundation. Instead of ignoring the signs, go out and get multiple estimates from professional and trusted fence companies. You can then narrow down your options and ultimately save yourself from a bigger problem. After a period of time your shower tiles may need to be retiled. When you notice that your water isn’t fully draining as it normally should, try and get it inspected. As stated before, obtain multiple quotes and repeat the process. You can also try and cut costs by seeing if it can be graded without replacing all of the tiling. Bio: Kuba Jewgieniew is the founder of Realty ONE Group, a full service residential real estate brokerage with over 6,000 agents and 50+ offices across the nation. Your front door is more than an entryway into your house. It commands major attention from the street and is one of the main factors in curb appeal. 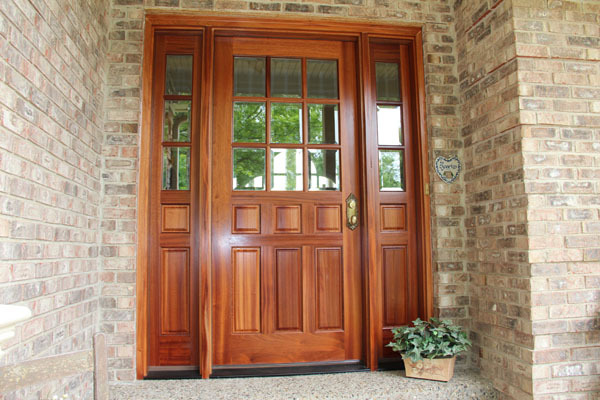 Here are some things to consider when buying an entry door. Each door has its strengths and weaknesses. From fiberglass to wood, choose the right type of material that best suits your environment and where you live. While they may all be aesthetically pleasing, the most important thing to look for is quality. Base your purchase purely off of quality, not its price. 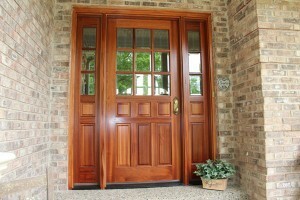 Buying a low-end fiberglass door just because it’s on sale will not last the changing weather patterns. Fiberglass and steel doors retain a lot more heat than a wooden door. Energy Star-qualified doors are tested and certified, providing you great insulation. Plus, it’s a cost-efficient way if you are looking for a door on a budget. Installing your door should be an easy process. Door systems known as pre-hung doors come with everything you need and are already set up. The only thing that you need to do is fit it around the frame, square it, and level it. If you decide on purchasing a new door, you might as well hire a contractor instead of doing it yourself. The amount of effort and intricate work that you have to put in is not worth the time. Keep your family safe from burglars and crooks. By purchasing a less expensive and hollow door, the chances of a burglar breaking into your house is pretty high. Upgrade your locks and the exterior door frame by using longer mounted screws. This will increase the resistance of your door. Bio: ETO Doors has grown to offer the largest selection of doors and hardware in the industry. With over 40,000 doors in stock, ETO Doors has the ability to fulfill your residential or commercial need. See for yourself, ETO Doors reviews contain positive feedback and customer satisfaction. Visit them today. There are so many ways furniture can get damaged. If your furniture features fabric then there is the possible loss of color. Upholstery made out of faux-leather often experience cracks in various places without the application of regular leather treatment. Pets tend to damage furniture with their claws. Foam is another that needsregular replacement as after years of use, sofa seat cushions tend to become flat and no longer provide adequate support to the body. 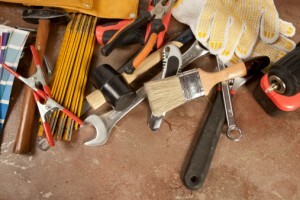 Ultimately, aside from wear and tear, your furniture will need constant maintenance. For wooden furniture, an effective way to ensure longevity is by applying a fresh coat of paint or varnish. The previous coating needs to be scraped off using sandpaper or a light scrub brush. The wood can then be treated and nourished before the paint or varnish is applied. Ideally, the coating would need to be thick enough to provide adequate protection. When replacing couch foam, use high density foam which is more durable and convenient for couches and bedding. Most foam companies offer custom sizing when it comes to foam products making it easy to order the whatever dimensions you require. The Foam Factory specializes in foam manufacturing. Their products are convenient for various foam replacement projects including for seat cushions. The porch swing used to be the centerpiece of any porch. The swing is now being replaced by its more modern counterpart, the hanging outdoor bed. The latter has the advantage of being more spacious, cozy and comfortable than the swing. It also provides the ultimate relaxation environment since it is basically a suspended bed, sometimes even coming in queen size. Building a hanging bed might be easy if you have experience with DIY projects. In case you are not, you might consider having the outdoor bed made and installed by a professional. The regular dimension of a hanging outdoor bed would be that of a twin bed. An adequate sized mattress should also come along with the bed. For a good mattress, Canada has many great suppliers to choose from. For the outdoorsCarlo Badalamenti, who has been in the foam industry for several decades, suggests that, it is better to choose a latex mattress or an open-celled foam to create a mattress. Protective finishes are important, especially for the outdoors. Exposed screw holes would also need to be filled with a wood filler and left to dry. The hanging bed would then need to be scrubbed with coarse sandpaper. The protective coating/finish can then be applied and left and left to dry. The daybed can be hung using lag screws directly on the beam or rafters. Ropes or chains can be used for this. The hanging bed would then be ready for the mattress or bedding. The ideal hanging height is at 18 inches to the top. Foam Factory, Inc. specializes in foam products such as the memory foam bed. An air compressor is one of the most useful objects that you can have in your home. Snap-On air tools offer a wide range of uses that can help you maintain your home, and complete new projects. A compressor forces air out of a hose, typically with a small nozzle attached. If you’re on the fence about getting your own air compressor, consider the many reasons there are to use one. Pressure washing uses the pressure inside the air hose to force water out at a particular pressure. Be careful that you do not approach these projects with the pressure set too high, or else you could damage what you’re working with. You can improve the value of your home by pressure washing the cement outside of your garage to wipe away old oil stains from years of use. Pressure washing is also useful on the siding of your home, where dirt and debris tends to accumulate from years of use. You can change a car tar much faster with a pneumatic torque wrench. The air pressure from your Snap-On air compressor can be used to power lots of tools. Air nail guns use pressure to force nails through a wall with precision. Staple guns also work, but tend to find more use on softer woods. Drills and drivers help you complete a difficult task that requires a lot of effort in seconds. Attach a small air hose to the compressor and you have a blast of air you can use to clear debris away from a project. Wood and metal workers use this technology frequently as debris builds up. 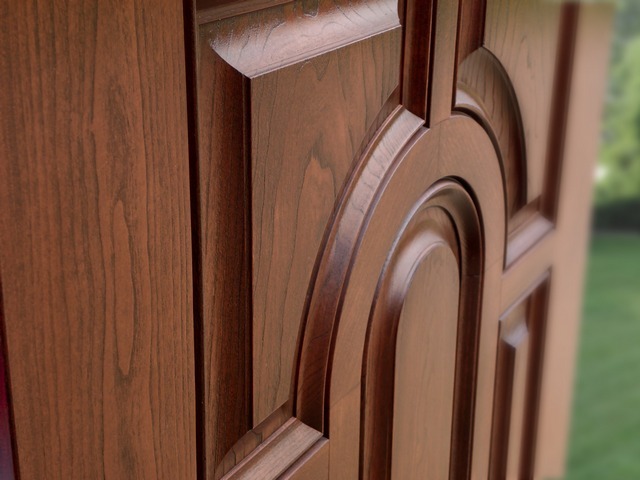 Wood working requires precision, and dust can obscure the detailed pattern someone is working on. The hoses can also be useful as part of a cleaning station, in case you get debris in or near your eyes. Don’t forget the obvious uses! You can use an air compressor to inflate car tires and game balls around the house too. It’s not all that life changing, but you won’t need to make trips to the gas station before work. Plus, you can keep your tire pressure regulated for maximum gas mileage. Attaching a nozzle and paint system to your compressor makes the job of painting your home much easier. Hobbyists also use compressors to refurbish old furniture, as it’s often easier and cleaner to spray paint onto a curved surface than to use a brush. Written by Foam Factory Inc. The living room is one of the rooms of the house where your family and you tend to spend the most time. Your living room would possibly be the host of your TV set and have some furniture such as a couch, a coffee table and accessorized with a carpet. Depending on your budget, certain small changes can help you give a new look and feel to your living room. Sometimes you can just get a different paint job and some brand new cushions and change the color and design of their covers to add a little pop of color to your living room. The change would be more visible if your cushions were starting to get slouched. Getting brand new bouncy foam cushions would definitely bring a change and make your furniture look for comfortable and inviting. You can opt to carry out your sofa foam replacement project yourself. This can be a fun and gratifying task as you will get to choose the color and design of the materials used. Some foam manufacturing companies offer custom-cut foam services. You only have to measure down the dimensions of your couch and have them cut the foam to fit your project. The Foam Factory is a company specializing in foam products and they offer solutions to foam replacement projects with custom-cut foams. Their staff are ever ready to help you in choosing the right foam for your project.